Gen 2:18 The LORD God said, "It is not good for the man to be alone. I will make a helper suitable for him." Notice it does not say man was lonely. It says he was alone, a single entity, not part of a pair as the animals were. This is what was not good, that there was only one. Gen 2:21-25 So the LORD God caused the man to fall into a deep sleep; and while he was sleeping, he took one of the man's ribs and closed up the place with flesh. Then the LORD God made a woman from the rib he had taken out of the man, and he brought her to the man. The man said, "This is now bone of my bones and flesh of my flesh; she shall be called 'woman,' for she was taken out of man." For this reason a man will leave his father and mother and be united to his wife, and they will become one flesh. The man and his wife were both naked, and they felt no shame. Men and women are created in the image of God, and because of that, both are valuable in God’s sight. We have been created different; nevertheless, we have equal worth. The Bible does not support the view that women are inferior in worth to men. They have been created in the image of God like a man and are just as valuable to Him. To treat women as something less than a man is a sin that demeans the image of God. The Bible also teaches that men and women have equal giftings. That means that every gift of the Holy Spirit is available to both men and women. When Paul writes to the Corinthians he does not indicate a difference for men or women in receiving gifts of the Holy Spirit. 1 Corinthians 12:7 Now to each one the manifestation of the Spirit is given for the common good. Both men and women, who are believers, are given spiritual gifts as the Holy Spirit determines. Women have the same responsibility as men have to use those gifts in accordance with God’s plan, to continue to grow in their own faith as well as for the good of the Church. Although men and women have equal worth and equal gifting, we also see that men and woman have a different design. Going back to Genesis 1:27, we see that God created man male and female. While we are of the same kind, human, we are distinct, male and female. We see this in the New Testament as well, that we have been designed differently for the purpose showing love and picturing the relationship between Christ and the Church. Eph 5:31-33 "For this reason a man will leave his father and mother and be united to his wife, and the two will become one flesh." This is a profound mystery-- but I am talking about Christ and the church. However, each one of you also must love his wife as he loves himself, and the wife must respect her husband. 1 Corinthians 11:11-12 In the Lord, however, woman is not independent of man, nor is man independent of woman. For as woman came from man, so also man is born of woman. Men and women need each other for life. Now the question is: does this difference in design between men and women have any bearing on the roles we play in life? The answer is yes. God’s design determines our role, but that does not make one gender inferior to the other. The answer is “yes” solely due to God’s perfect design. Right from the very beginning we see God designed men and women differently, and one of the first things we see is the different roles for which He designed us. And again, in Genesis 2:18, God says, "It is not good for the man to be alone. I will make a helper suitable for him." So generally, mankind has been given the role to rule over the earth and specifically, men have the responsibility of being the head of that role and women have the responsibility to be a help to men as the head. Now in the New Testament we see some of the specifics of how to apply those role responsibilities in a couple of different places. First, we see that God’s design determines our role in the home. Ephesians 5:22-23 Wives, submit to your husbands as to the Lord. For the husband is the head of the wife as Christ is the head of the church, his body, of which he is the Savior. Husbands are to be the head; wives are to be the helpmate. That is easy to quote, but the question for us is what does that look like practically? Within the home and within the marriage, women are to be recognized as equal in worth and respect in this head and helpmate relationship. In fact, not showing respect to the wife is sin. Here is what a home should look like with a proper head and helpmate relationship. It should look like a husband and wife discussing situations, and the wife being the helpmate that she is supposed to be in offering advice and suggestions and insight. By hearing her advice and counsel, the husband will be able make the best possible decision. The wife submits to her husband in the decision he makes and supports him fully, whether she thinks he is right or wrong, trusting God is in control and able to lead her husband according to His plan. She does not nag him, berate him, tell him she told him so if things go awry, but loves him, prays for him, and promises to go through the consequences with him, believing God works all things to good for those who love him and are called according to His purpose (Rom 8:28). Husbands, being the head of the home means that we are responsible for the decisions that are made in our home. So we had better use our wife’s wisdom, gifts, and counsel that God has made available to us through her. Husbands will be judged and held responsible for the decisions that are made in the home, regardless if they made that decision or not. That is why husbands are permitted to nullify a wife’s vow, and if he says nothing about her vow, he is responsible if she fails to keep it. The buck stops with the husband. Husbands will answer for the well-being of their family based upon their leadership or lack of leadership in the home. There will be consequences for the husband’s lack of leadership, and he will be responsible for those, not the wife, although he abdicates the leadership of the home to her. Wives, on the other hand, will be judged and held responsible for how well they helped their husbands in the home. Does she take control and do as she pleases, or does she submit and encourage her husband to lead her and the family? Now, I know that some wives are not content in this role. I want to tell you why that is, so we might be able to resist the temptations of Satan to ignore God’s design for the home. Wives are not content with this role because their discontentment is a result of the first sin. There will be times that a wife’s sin nature wants to take things into her own hands regardless of what her husband says. Listen to the curse that came upon women with the first sin. Genesis 3:16 To the woman he said, "I will greatly increase your pains in childbearing; with pain you will give birth to children. Your desire will be for your husband, and he will rule over you." Women experience pain in childbirth now and they desire the role that God gave to men, which was to rule over them. We see this in women often. A woman desires a husband, a man, to take care of her and things around the home. At the same time, she will say, “I’m not going to let any man tell me what to do.” It is because of the curse of sin. I believe that if we know that, however, we will have a better chance of defeating Satan and his temptations to ignore God’s design. Gal 3:28 There is neither Jew nor Greek, slave nor free, male nor female, for you are all one in Christ Jesus. We are all equal in Christ and we are one with Christ and with each other. We are His Body. Like a body, each part has different functions, but all the parts are of one body. God’s design also determines our roles in His Church in a couple of very specific areas. 1 Tim 2:8-14 I want men everywhere to lift up holy hands in prayer, without anger or disputing. I also want women to dress modestly, with decency and propriety, not with braided hair or gold or pearls or expensive clothes, but with good deeds, appropriate for women who profess to worship God. A woman should learn in quietness and full submission. I do not permit a woman to teach or to have authority over a man; she must be silent. For Adam was formed first, then Eve. And Adam was not the one deceived; it was the woman who was deceived and became a sinner. First, a woman is not to teach or have authority over a man. Notice that Paul does not give any cultural reason for this prohibition, but goes straight back to the created order as well as the first sin, which brought the curse. This explains why God designed men to teach men, and it also explains why a woman may desire what she wasn’t designed for--because of the sin which brought the curse. This does not mean that a woman is not capable or does not have the ability to teach a man. It only means that God did not design things that way and we glorify God as we do what He says. Furthermore, God’s blessings will be upon all who follow His design. Secondly, God determines who will lead the Church. The Church consists of men and women, but the men are to be in authority over the Church because of God’s design of headship. 1 Timothy 3:1-7 Here is a trustworthy saying: If anyone sets his heart on being an overseer, he desires a noble task. Now the overseer must be above reproach, the husband of but one wife, temperate, self-controlled, respectable, hospitable, able to teach, not given to drunkenness, not violent but gentle, not quarrelsome, not a lover of money. He must manage his own family well and see that his children obey him with proper respect. (If anyone does not know how to manage his own family, how can he take care of God’s church?) He must not be a recent convert, or he may become conceited and fall under the same judgment as the devil. He must also have a good reputation with outsiders, so that he will not fall into disgrace and into the devil’s trap. The role of an elder is also a teaching role in the Church. This clearly indicates that God has designed this role for the man. So what would this look like in practice? Mostly, I am happy to say, it would look like First Christian Church of DeQueen. So, what can a woman do? A woman can fill any role not specifically designed for a man, which are teachers to men and Elders in the church. Therefore, a woman would not be able to lead a Bible study designed for both men and women and would not be able to have the authoritative role of elder or pastor in the church. On the other hand, the older women are commanded to teach the younger women how to be good wives and mothers. A woman is able to exercise her gifts of leadership by leading women’s ministries or special events. A woman is able to exercise her teaching gifts in studies designed for women or children. A woman can exercise her counseling gifts by counseling other women and assisting the elders when they need to counsel women. A woman can sing and praise God during worship. A woman can give a report and offer an opinion during business meetings to inform the elders of information they need to make good decisions. However, when doing these things, the women still act under headship of either their husbands or the leaders of the church. A woman is not to speak during church services. If she has questions, she is to ask her husband at home. In the case of no husband, a woman may ask the church leaders questions after services in the presence of another woman. God desires our worship services be orderly and under the leading of the Holy Spirit. 1 Cor 14:33-38 For God is not a God of disorder but of peace. As in all the congregations of the saints, women should remain silent in the churches. They are not allowed to speak, but must be in submission, as the Law says. If they want to inquire about something, they should ask their own husbands at home; for it is disgraceful for a woman to speak in the church. Did the word of God originate with you? Or are you the only people it has reached? If anybody thinks he is a prophet or spiritually gifted, let him acknowledge that what I am writing to you is the Lord's command. If he ignores this, he himself will be ignored. There appears to be many things a woman can do in the church, especially those things that are not forbidden. Men and women can both serve as ushers or greeters or be on the worship team. There are plenty of ministries for all men and women to exercise every one of their gifts in the Church. I thank God for the women we have at First Christian because we would not be able to function without them, just like we would not be able to function without the men serving in the roles for which God has designed and equipped them. Ultimately, to be a servant or have influence in the Church, does not require anyone to hold an office. Influence is gained through faithfully fulfilling the roles God has given us. God’s reasons for His order in the Church are clear. 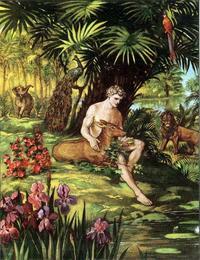 The lesson in the Garden of Eden is sufficient. The Bible says that Eve was deceived, it does not say that Adam was deceived; consequently, Adam is far more responsible than Eve because he sinned deliberately. There was no conscious intention to disobey in Eve’s heart, she was deceived by the subtle lies of Satan. Adam, however, was not deceived, he sinned with a deliberate understanding of what he was doing; so sin and death are associated with Adam, not Eve. When women take the lead, men let them do it. It is the sin nature of men and women to act this way, but God holds the man responsible for allowing this to happen. He has told us what to do. Men and women will both be blessed if they obey what He has said. Not everything was good in the Creation, because man was alone. So God made woman to be a blessing and a help to the man. Man is to love and care for his wife, for she is God’s gift to him. It is my hope today that we, as men and women, can greatly appreciate one another and faithfully fulfill the roles God has given each one of us in love and humility. We are not to let the culture influence our roles in the family and in the Church. We are to influence our culture for Christ by obeying God and sharing with people the Gospel of Jesus Christ. That means our families and we will be different from the culture, and the difference should be evident. People should notice the blessings that we experience as we live according to God’s design and order. Our families and church should be filled with love, peace, joy, and all the other characteristics of the Holy Spirit as we follow Him. If you don’t have those characteristics, I invite you to come and make Jesus Christ your Lord and Savior. Through Adam, we all have a sin nature and a death sentence, but through Jesus Christ we can receive a new nature, the Holy Spirit, and eternal life. Repent of your sin, give your life to Jesus through baptism, and receive the Holy Spirit today. Maybe you need to thank God for your spouse and repent of any sinful attitude you have toward them.